The Garmin Edge 810 is the top-of-the-range GPS cycling computer from Garmin. Featuring a 2.6-inch touchscreen and is waterproof, the Edge 810 measures distance, shows your speed, elevation and GPS position. By connecting the Garmin Edge to a Bluetooth enabled smartphone you can get weather forecasts and share your training and cycling activities with your friends and family. There are three different Edge 810 models available. Although the unit is identical, each bundle pack saves you money if you require further accessories. Extra accessories include Soft Strap Premium Heart Rate Monitor, Speed/Cadence and road maps of Europe. See below for more information. Accessories, spares and parts are still available for your Edge 810, as are various on-road and off-road maps. The Garmin Edge 810 is the latest cycling GPS navigation computer system from Garmin. This top-of-the-range model has an easy to operate 2.6-inch touchscreen and is rugged and waterproof to IPX7 standards with a lithium-ion battery life of up to 17 hours. ‣Edge 810 Performance Bundle - as above model, also includes premium heart rate monitor and speed/cadence sensor. ‣Edge 810 Performance and Navigation Bundle - as above model and also includes City Navigator NT Maps of Europe (street-level) on plug-and-play microSD/SD card. All three versions can be purchased by clicking the revelant 'add to basket' option above. 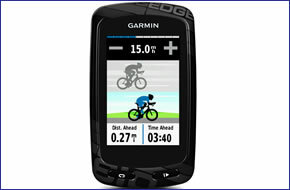 The Edge 810 measures distance covered, displays speed and ascent/descent data and GPS location. Additionally if you buy either of the Edge 810 Performance Bundles they include a premium heart rate monitor and speed/cadence sensor. The Edge 810 features a barometric altimeter and temperature gauge which displays the temperature while you ride. Plus with its internal memory you can store up to 200 waypoints, routes, points and locations. You can connect the Garmin Edge 810 wirelessly to a smartphone (Apple or Android) via Bluetooth with the Garmin Connect Mobile app. You can get information such as weather forecasts direct to your Garmin device. With Garmin Connect you can manually or automatically enable friends and family to track you live on your journeys, training and races. In addition you can send and receive courses. All three models of the Garmin Edge 810 come preloaded with a basemap. In addition the Edge 810 Performance and Navigation Bundle also includes City Navigator NT European maps on SD/microSD Card - making this option ideal if you intend to use the Edge 810 for road cycling right across the UK, Eastern and Western Europe. If you intend to cycle on roads in just the UK or Ireland, then you may like to consider buying a different model and then add UK and Ireland City Navigator NT street-level road maps. If on the other hand you'd like to take the Edge 810 and your cycling off road for e.g. mountain biking, then you'd be better off considering adding either Garmin Edge 810 TOPO or GB Discoverer maps. TOPO maps provides land contours and elevation for Great Britain at a scale varyng between 1:50k to 1:100K. GB Discoverer maps provide full Ordnance Survey Landranger maps with the same detail as the paper version and at a scale of 1:50k or 1:25k. Furthermore the Garmin Edge 810 enables you to change the activity profile of the user with a single swipe of the touch screen. The user can choose between roads, mountain and touring settings which sets up your data preferences for each profile. Looking for accessories and spares for the Garmin Edge 810? All parts are genuine Garmin product and specifically designed for use with the Garmin cycle GPS 810 device. Discover the optional range of maps that you can add to the Garmin Edge 810 here. Maps available include GB Discoverer Ordnance Survey (OS) mapping, Cycle Map Europe and TOPO topographical mapping.